It's been a while. Family health matters has been our primary concern for a few months, so we've just been taking care of basics. But things are difinitely on the mend now and it's back to work for me, getting out some information on what we've been doing, garden-wise. I'll be posting a series on our self-watering container upgrade, as it were. 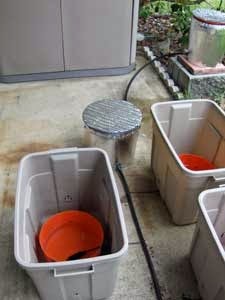 If you recall, we started researching a better way to build self-watering containers last fall. This spring, ol' Bill's been perfecting the process and has two systems up and running. 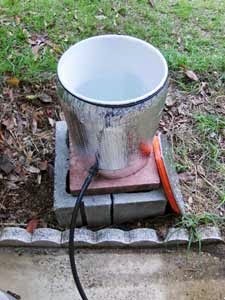 This new system, although a little involved at the start, is a major improvement to the whole self-watering container garden idea. 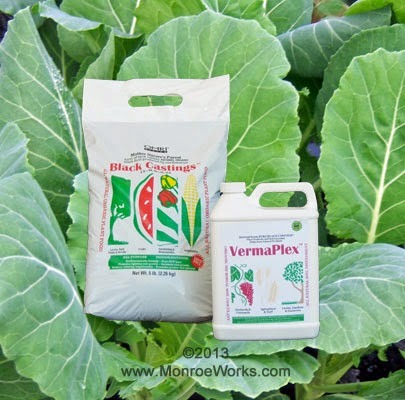 Eliminating the constant watering chores was our primary reason for going the self-watering container route. 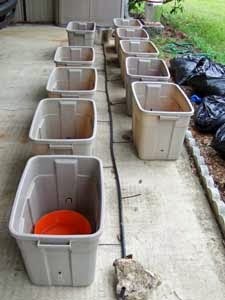 However, with our initial self-watering garden, we found that we still had to add water to each and every pot, each and every day in order to keep the reservoir full. The pots were doing the job of providing constant moisure in just the right amounts to each and every plant, but the size of the reservoir required daily filling. Ol' Bill was wearing himself out adding water to each and every dog-gone pot, each and every dog-gone day. Heck, I was tired just watching him (I do have to observe in order to document the proceedings, you know). I know, I know, it looks like the Army Corp of Engineers paid us a visit. But it's not that complicated and this site we found, Easiest Garden, has some great instructions for the whole process. Again, I have no affiliation with them, they don't even know who I am (can you imagine?) but I want to give them credit for developing this great idea. More to come on our results (hint: it's fantastic!). Improvements to Self-Watering Container Garden : See the beginning of our new project.